Featuring 17 of Queen’s Most Iconic Hits! 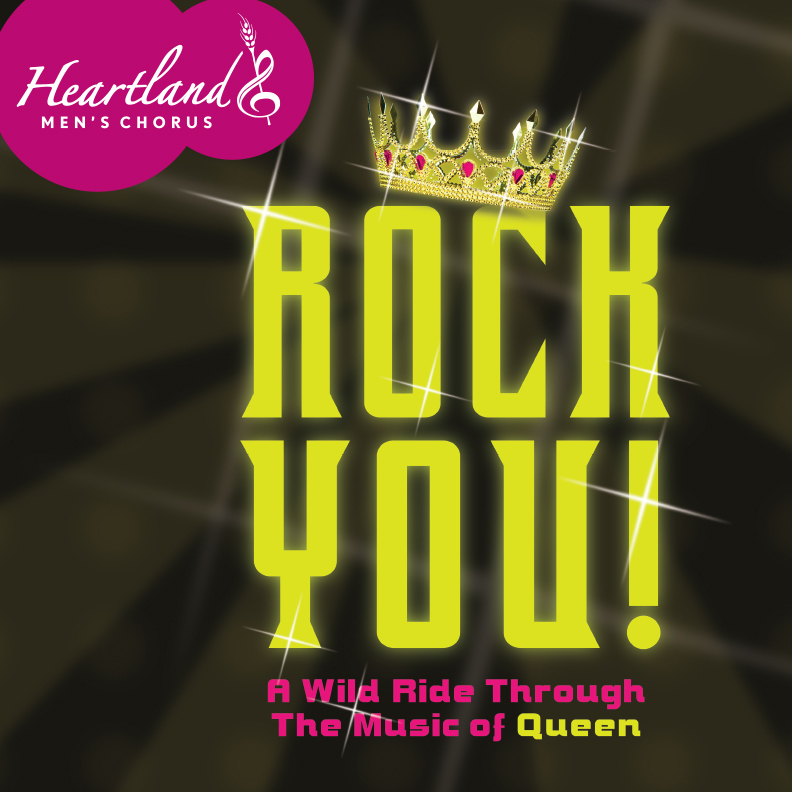 KANSAS CITY, MO (April 17, 2019) — Heartland Men’s Chorus (HMC), announced today their 33rd season continues in June with ROCK YOU: A WILD RIDE THROUGH THE MUSIC OF QUEEN! Who better to bring the music of one of the greatest rock bands in history to life than Kansas City’s gay men’s chorus! Featuring the most iconic hits from one of the world’s most beloved bands, Rock You will be a musical extravaganza that includes a full evening of rockin’ favorites. It will take you back to the 1970’s and 1980’s and have you screaming, “We Will, We Will Rock You” before the curtain falls! Founded in 1970 in England, Queen released their self-titled debut album in 1973 in both the UK and the US. Despite not being an immediate success, they gained popularity in England particularly with two songs of the original album, “Keep Yourself Alive” and “Liar.” With their second album released in 1974, also known as the “heaviest” rock album they created, Queen II was heavy rock with a Baroque sensibility that combined emotional themes and fantasy which would become part of their staple. It also touted an iconic album cover depicting the album’s black and white themes that would be used by the band throughout their career. Through 25 years and 40 albums, including their 1981 Greatest Hits, the best selling album of all time in the UK, Queen’s sound with their explorations in funk, opera and pretty much everything in between formed the bedrock of their success and created a wide-ranging offering like no other band before or since. And oh yes, they created 189 songs of which HMC will cover 15! “We Are The Champions” – One of Queen’s biggest hits and most recognizable anthems, it begs to be sung at the top of one’s lungs. It was first released on their album News of the World in 1977. “Crazy Little Thing Called Love” – Written by Mercury in 1979, no Queen show is complete without it. With its rockabilly flair and easily sing able lyrics, it was Queen’s first number-one single in the UK. “Bohemian Rhapsody” – A six-minute “suite” which was unheard of at the time, the song had several sections which included an intro, a ballad, an operatic section, a hard rock passage, and a philosophical ending. Although critical response was initially very mixed, it went on to become Queen’s most popular song and is considered one of the greatest rock-n-roll songs ever written. “Killer Queen” – Again written by Mercury for their Sheer Heart Attack album, the single was Queen’s first US hit and was Mercury’s tribute to a champagne drinking prostitute! “Somebody to Love” – Written by Freddie Mercury, it debuted on the band’s 1976 album A Day at the Races and also appeared on their Greatest Hits Reputed to be Mercury’s favorite song, the lyrics reflect a man asking God why he works so hard but cannot find love. He instead finds hope and not defeat. “We Will Rock You” – This arena rock epic was written to get audiences to participate more in Queen’s concerts. Written by Brian May in 1977, the song is written mostly in a cappella form using only stomping and clapping as a percussive beat. It has become one of the most utilized stadium anthems played at sporting events around the world. Rock You: A Wild Ride Through the Music of Queen! will be performed at 8 p.m. Saturday, June 8th and 4 p.m. Sunday, June 9th in the C. Stephen Metzler Hall at the historic Folly Theater, 300 W. 12th Street, in downtown Kansas City, Missouri. Tickets to both performances are available online at http://hmckc.org/tickets/ or by calling 816-931-3338. Prices range from $18 to $43 with special student pricing at $7. Come as you are. Or come dressed as Queen! But visit hmckc.org today! Visit www.hmckc.org for more information about Heartland Men’s Chorus 2018-2019 season. High-resolution photos of the 2018-2019 Season can be obtained by contacting the chorus office at 816-816-931-3338.